You may also import contacts by uploading a formatted CSV file. In this tutorial, you'll learn how create and manage a list of contacts. Upload from a file. Be sure to format the CSV correctly. Name your list and click Save. To add contacts to your list, start by clicking the Contacts icon on your new list. You may paste a list of contact emails, or contact emails + first name values. Note: If you're pasting contact emails and names, you must use the correct formatting and include email, firstname above the data you're adding to the list. You may also import contacts by uploading a formatted CSV file. 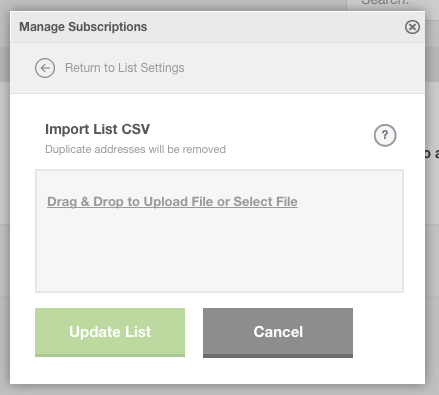 Simply drag and drop your CSV into the uploader, click Update List and you'll receive an email notification once your list has finished processing. If uploading only contact emails, your CSV should include one email per line in a single column. If uploading contact emails and names, your CSV must define the two header columns as email and firstname. Download an example here. There may be an instance where you may want to see a list's ID – such as for custom list implementations via our REST API. You can easily find a list's ID below the name of your list in the contacts view. 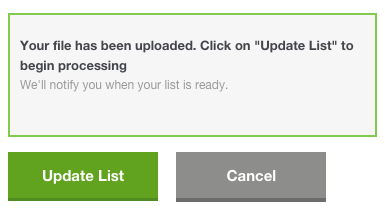 Use our easy copy-paste feature to copy the ID of your list. 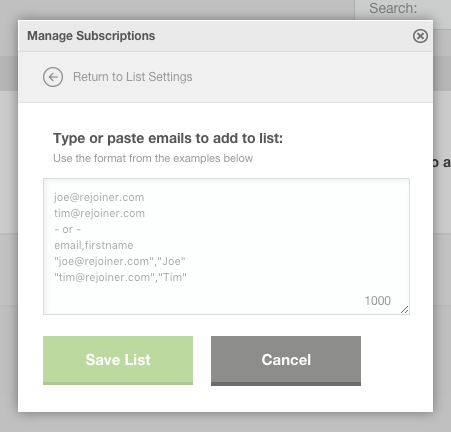 You can use merge tags in order to inject List data into your emails. Custom field merge tags are only used when your Lists have custom data being passed to us via REST API.